Background: I was invited by UCL Partners to present at an Innovation Diffusion workshop for NHS London. The paper was subsequently presented to the NHS London Clinical Senate. As Deleuze & Guattari would say, the NHS is a striated space. The quickest way to add innovative 'smooth spaces' is by combining digital tools and social movements. Slides below, full paper attached: comments welcome. Although I've only been at Media for Development for a week, I can already see the potential for digital innovation to boost MFD's mission. I hope that a mashup of my background in web & social change and Media for Development's experience of participatory media will produce some pioneering ways to empower marginalised communities. So here's a snapshot of my thinking about where to go and how to get there. My starting point is the way Media for Development uses participatory media to help transform people's lives. As a digital guy, this seems to me like a good match for the 'maker' meme - people participating in building their own stuff and their own solutions to problems. To my mind, a good starting point for MFD digital projects would be co-creation and the kind of co-design promoted by @thinkpublic and @wearesnook . This can by carried through the technical side of digital projects by appropriating agile development- the tech project methodology that iterates in small stages, keeping the project close to the users and allowing it to adapt as new issues and opportunities emerge. At the other end, the digital scene is a wellspring of questions about impact and ROI, as embodied by Measurement Camp. The visibilising of social connections that's embedded in the social web makes social network analysis a way in to measuring impact, especially around ideas of social capital. And I expect Social Return On Investment (SROI) will be a useful way to pin numbers to our projects in a way that aligns with MFD's values. Of course, the most powerful way to convey impact is to hear from people themselves and MFD is already expert in the power of narrative. One of the biggest challenges that faces MFD or anyone trying to build peer to peer support is the investment of time and resources it can take to get self-generating momentum in an online community. My first ideas about tactics is to start with stuff that's simple and useful, and can be applied immediately in people's lives. There were some good examples of this at Jailbrake - an event that applied the Social Innovation Camp approach to making web & mobile services for young people caught up in the criminal justice system. 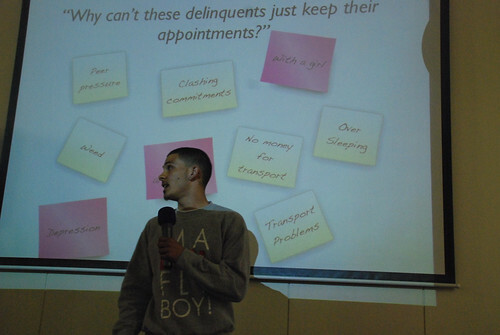 For example, we heard that even a simple text reminder at the right moment can make a difference by helping someone with a fairly chaotic lifestyle make it to their probation appointments. As one of the founders of Social Innovation Camp, I'd say its approach has a natural fit with media for Development and I'm expecting to draw a lot on @sicamp contacts and experience as I go forward with projects here, including the aim of making enterprises not just projects i.e. innovations that can find a way to be sustainable instead of petering out when the initial funding fades away. But no statement about strategy would be compete without a 2 by 2 matrix :) so here's mine for MFD-Digital: with communities along one axis and digital along the other, we start with the communities that MFD knows well (e.g. people with experience of prison) and the tech that has already been successful (like the online community of Savvy Chavvy). Innovation on the communities axis means new hard to reach groups, and MFD already has plans to work with military veterans, and with young dad's who are in danger of being excluded from parenthood. Innovation on the digital axis has some straightforward starting points, like mobile and mapping: i've been inspired by the potential of open street mapping to catalyse community mobilisation, and i've already met with frontlinesms to look at ways that toolset can help overcome the digital divide here in the UK. In the future we may convene sicamp / crisis camp style events to catalyse unexpected digital innovations. At the end of the day, though, it's not about tech but about the potential of digital to enable transformation; a change in people's lives and ultimately in themselves. And also, perhaps, in those of us doing this work. I'm looking forward to reporting irregularly on this journey. geeKyoto is the latest eclectic social-impact event with it's roots in London's digerati. Inspired by TED and last year's Interesting2007 event, Mark Simpkins and Ben Hammersley have taken the DIY approach to curating a cross-discipline eventÂ to discuss the future and how we'll live in it. London (a venue with a noble history of supporting free thought). Tickets are a modest Â£20 and available at http://www.geekyoto.com/ where you can also find a listing of the groovy speakers. As David Wilcox has pointed out there's a growing buzz in London about what happens when the social web meets social need, of which our social innovation camp was one flowering. Something's cooking. Steve Moore, the arch (un)organizer, is bringing together social entrepreurs, innovators , software dvelopers and other social media types for the 2gether Festival (July 2 and 3rd, backedÂ byÂ Channel4). Maybe that'll be the ignition point for some serious stuff at scale. I'm really starting to think that games are one of the magic ingredients in getting this new wave of social change off the ground. When I was at Amnesty I wanted to use games to raise awareness, but maybe we should just make more actual stuff in to games if we want to get a result. After a the excitement of last weekend's Social Innovation Camp I wondered if part of its magic was that it was a game. Applying competitive teams, rules and time limits to a bunch of hackers & creatives really did the trick. Last week's How I fell in love with Wikipedia article quotes its first employee saying "it's almost more like an online game, in that it's a community where you hang out a bit, and do something that's a little bit of fun: you whack some trolls, you build some material, etc". In this week's updated post on Thinking out of the (x)Box: Gaming to expand horizons in creative writing Ewan McIntosh reports myriad ways in which "Certain games are incredibly effective at generating more expanded horizons in students imaginations when they are writing and speaking creatively or transactionally", And his references to "the moral dilemmas and complexity of decision-making in more long-term games like Sim City or Rollercoaster Tycoon" indicate how games could impact the youth enterprise agenda of my day job. But it was Charlie Leadbeater's invocation of I Love Bees in Social Software for Social Change that switched me on to the exciting social potential of alternate reality games (ARGs), a trail I followed to Jane McGonigal's World Without Oil. As Jane says; 'Reality is broken. Why aren't game designers trying to fix it?'. So with all this incoming synchronicity I was delighted when David Lundblad invited me to the Gaming for Good event he's puttiing on with Johnnie Moore on Wednesday, April 16, 2008 4:00 pm - 6:00 pm at NESTA: "An informal gathering of people who think that organisations and society can benefit from a deeper appreciation of the upside of gaming - whether that's online mutiplayer games or real world games..." According to David, they see the three main themes as gaming to improve products & services, gaming to improve organisations, and gaming for social good. As per Ewan's stuff, we should add gaming for education. Then you've got yourself a pretty broad swathe of social impact where games could be a magic ingredient. Whereas Games for Change (G4C) uses gaming as a way in to social issues, it might be that the bigger long term impact comes from a general spread of a gamer attitude. Research tells us that young people in the UK already treat social media as a multinodal game; so the gamer attitude could spread to online/offline projects for social impact, bring with it the energy, imagination and lateral thinking that makes solving problems into fun. Amazing amount of buzz at today's Social Innovation Camp. A diverse bunch of dedicated folk has alighted at the Young Foundation ; and Simon Tucker 's welcome last night made it clear we're continuing Michael Young's tradition of disruptive social innovation. Working with the Prison visits team (I like my projects to be gritty :) was fascinating. For me, it surfaced some of the tensions implicit in the Social Innovation Camp mission, as we discussed our way passed the idea of creating a better information site or helping NGOs to coordinate better. And there's some merit in asking whether nonprofits, designers, and techies can talk to each other . (The answer, by the way, is yes). There's also a creative tension between the breadth of the social mission and the endless possibilities of technology versus the need to produce a working prototype in less than 2 days. Time to apply Michael Young's principle of "benign ruthlessness". With a bit of prompting from Greenman we settled on a simple user review system as our technical nugget. As Jeremy Gould pointed out, we can emulate MySociety projects by offering users more opportunites to get involved as later steps. And since the potential for big vision advocacy relies on building the community, we wanted an easy and useful hook to get it all started. As someone complained that the Government should be doing this stuff anyway, I remembered one of my personal aims for setting up Social Innovation Camp; a notion I'd call 'campaigning by doing'. As our friends from the Prison Advice & Care Trust pointed out, prisoner's advocates can argue till they're blue in the face without any response from The System. But with the low barrier power of the social web, we can do something small right now to tackle a problem by tapping in to the experiences of those who are affected. And if that snowballs, like Patient Opinion, it becomes something that institutions have to take notice of. As I wandered around all the projects I was struck by the different approaches; from an attic of half-a-dozen geeks to a discussion circle of eighteen worrying about trust, from massively detailed user stories to balloon metaphors. It seems to me that the Social Innovation Camp is a laboratory, fast-tracking the kind of fall-out that startups experience, and raiding the recent history of the social web (from wikipedia to netmums) in search of conceptual templates. I'm sure that Aleksi Aaltonen will have more to say post-Camp about the patterns of co-creation that emerged. When Mikey from The People Speak was interviewing me about the Camp he reported his observation that the geeks tended to sit in straight lines. And I saw plenty of discussions happening in circles. Should lines and circles be the new logo of Social Innovation Camp? I'm very pleased to announce the call for ideas for our first Social Innovation Camp . "What happens when you get a bunch of hackers and social innovators together, give them a set of social problems and only 48 hours to solve them? Weâ€™re going to find out. In London between 4th-6th April 2008, Social Innovation Camp will bring together some of the best of the UK and Europe's web developers and designers with people at the sharp end of social problems. Our aim is find ways that easy-to-build web 2.0 tools can be used to develop solutions to social challenges." Over the next few days we'll be adding more and more to the site and, hopefully, kicking off conversations about Social Innovation Camp. We'd like to see it as a mashup of barcamp, netsquared and a few other mongrel ingredients - but what it will become is largely UP TO YOU. So please get stuck in, and help spread the word. i'm a widget believer - but that's mostly a hunch. Sitting in the Widgety Goodness (WGUK07) conference today, my experience is as much of absence as of goodness, even though I agree with Ivan the organizer that widgets will change everything. The geek in me is interested in the distribution mechanisms and the API's - but where's the sense of social relevance? Maybe we've got to wait a while before a new danah boyd can write about the cultural significance of widgets. Which is a shame. Because surely, surely, this user-powered collaging of the web landscape will have some impact on power relationships online. Isn't that why people are getting excited about Open Social (even though WGUK07 speaker Ankur Shah explained why this is still more hype than reality). The overwhelming perspective seems to be 'how can we as digital agencies use this for the client brand'? Fair enough - but missing the wider impact. To be fair, speakers like Russell Davies put a lot of emphasis on utility, on how a widget can tell me something useful i didn't know. Even better, Russell put it up a gear by reintroducing the idea of fun, and pointed to embodied / offline examples like the Sharkrunner game . (Note: like Charlie Leadbeater i suspect that Alternate Reality Games have a lot to teach us about tools for social change). When I was at Amnesty we launched irrepressible.info with a widget that allows you to undermine censorship by publishing fragments of censored material on your site. MAPLight.org said they would use NetSquared funds to create customized â€˜widgetsâ€™ showing campaign contributions and votes in U.S. Congress, updated in real-time. And Steve Bridger has already blogged about a widget response network for emergencies like Darfur and Chad . Maybe when we run the Social Innovation Camp (details coming soon) we'll follow Channel 4's example and run a widget category. As widgets become more widely used I'm sure we'll see widget-based social innovation - and that'll really pump up the goodness in Widgety Goodness. UPDATE: for interesting posts from other participants, check out the post-conference feeds atÂ the Widgety Goodness backnetwork . A big shout out to the organisers of the Web2forDev conference in Rome. They're shaking the hype out of web 2.0 and wrestling it in to relevance for the world's poorest and most marginalised. If I'd had a chance to contribute to the conference, I'd have stepped back from the real issue of rural connectivity and looked at the less examined issues of innovation and censorship - the good and bad futures for the social web in the developing world. The bad news first - as soon as social media starts to make a real social difference it will be subject to some form of repression by those who favour the status quo. The downside for web 2.0 is that, under the wrong circumstances, its social networking side could become an engine for privacy invasion and surveillance. We must learn from places where social media survives and thrives in the face of corruption, military might, and the intimidation of opponents. Embedding human rights in social media requires eCampaigning for Internet Freedom. The real powerhouse of web 2.0 for dev will be innovation, the disruptive fruit of all architectures of participation. Charlie Leadbeater's book We-think starts with the example of the Barefoot College before going on to show how examples like Wikipedia are the herald of a new era of mass collaborative innovation. His wide global analysis of the new era mashes silicon valley with social innovation - as he says about a peer-to-peer AIDS support network "Low-cost, self-organising networks might be the height of organisational fashion on the US west cost but they are a matter of life-and-death in places like Mbuya Parish, Kampala". Work within Movements: Working within a movement means that all the talent of the various members can be brought to bear in creating solutions and the lines of communications within the network can be used to quickly disseminate new methods. Worship the Power of the Network: Through networks we aggregate our knowledge, amassing insight that is greater than the sum of its parts. Bring Technologists and Advocates Together: Innovative solutions emerge when technologists collaborate with advocates, working on a specific campaign problem or network goal. Build Innovation Systems: Rather than think of innovations as pieces of hardware or even creative ideas, it is better to think in terms of "innovation systems," combinations of hardware, social structures, and economic models that solve social problems. Promote Independence not Dependence: Seek to empower, and explicitly address sustainability. Engage with Youth: In almost all societies, young people are most likely to adopt new ICT methods. They are more familiar with ICT because it has been present for most of their lives. I applaud the organisers and participants at the web2fordev conference for their global fusion of social media and social impact. The scale of that impact will depend on how well mass creativity can challenge the status quo. As the APC's Anriette Esterhuysen says "The key is NOT to think of social networking tools (or Web 2.0) as a completely new set of tools/applications. ... but as representing significant changes to power structures that characterise the creation and use of content on the internet".